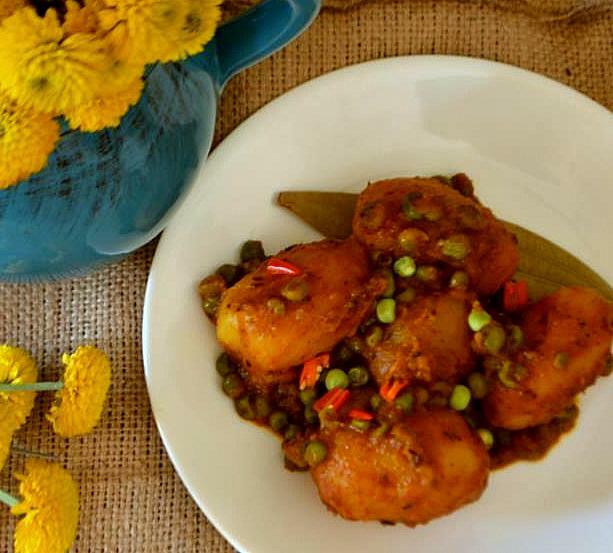 Koraishuntir Kochuri, which is also known as Motor shuntir Kochuri or Peas Kachuri is a winter delicacy, always served with some Alu r Dom, a perfect made-in-heaven combo!! 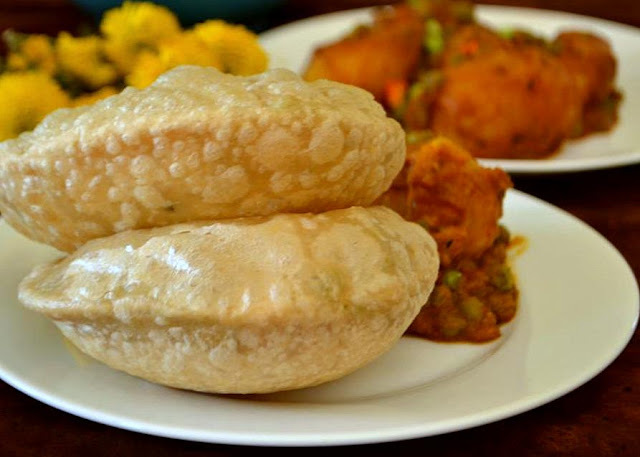 Generally served as breakfast, sometimes along with a bowl of Bengali style Chana Daal, followed by a sweet bite of hot Jalebi. 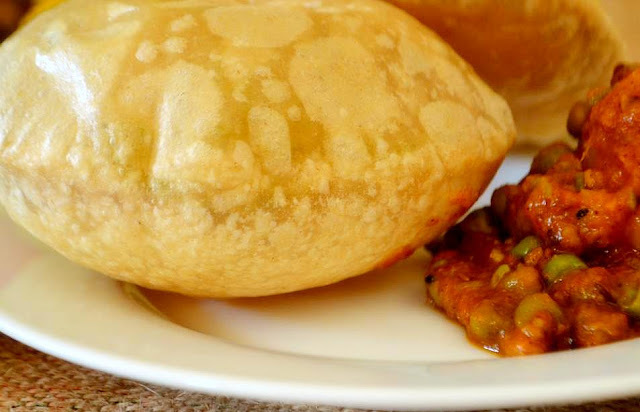 Being a late riser and staying with a health conscious husband, I never made this as a breakfast meal rather we relish it at our Friday night dinner. 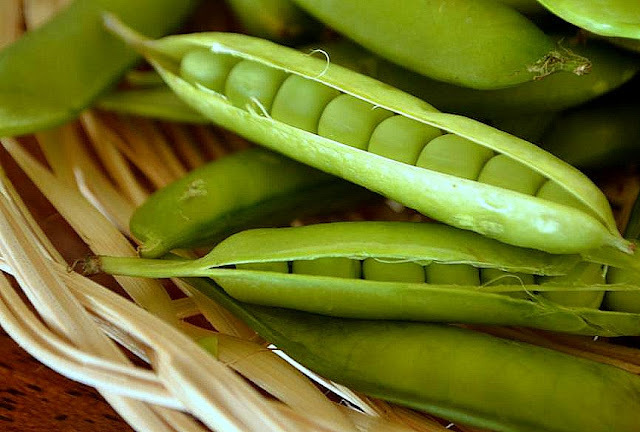 Earlier green peas were only available at winter season. 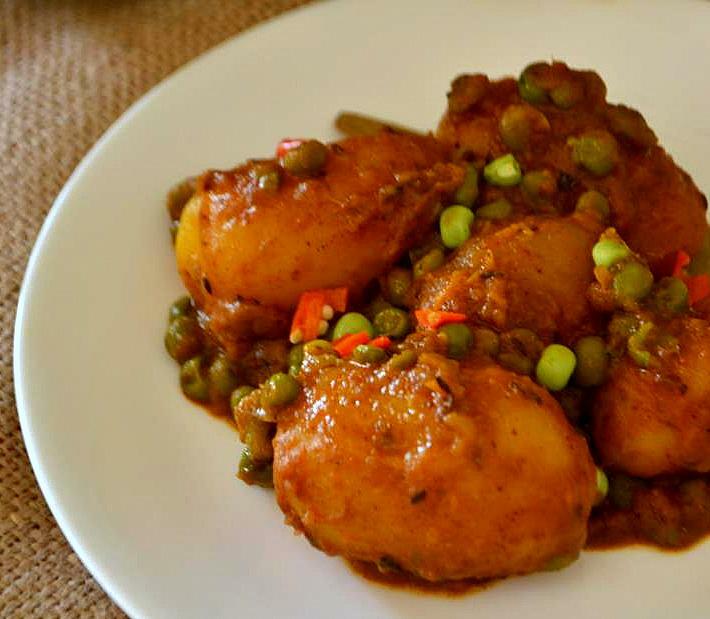 I have nice memories of those old good days when me and my sister used to shell the peas when my mom was planning to make Peas Kachuri. 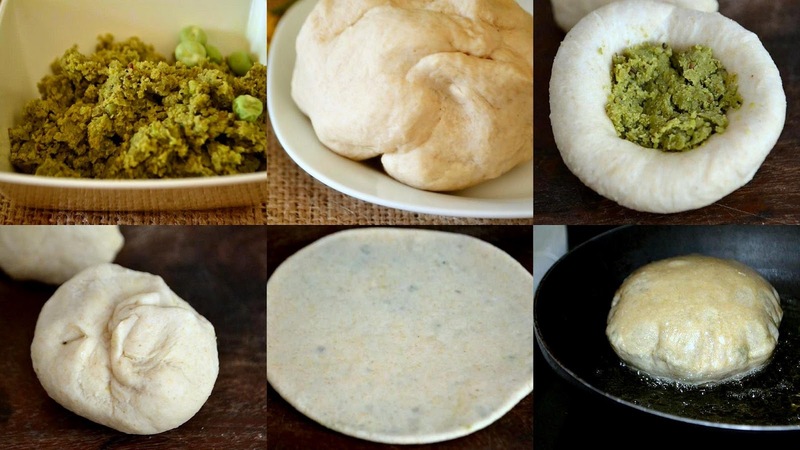 These days you get frozen peas in supermarkets in any season, so no need to wait for winter any more to taste peas Kochuri. It was not too easy for me to make this kochuri perfectly, even till last year I was struggling to puff my Kochuri. Now after some hours of practice, I mastered this skill. :) I used to make it once in a year but couldn't remember how I did last time. But practice, the only thing which can make you perfect. These days I'm very much confident that my kachuri will come out the way I wanted. If it is your first try, control yourself from putting too much stuffing. It can come out when you roll them out and if the kochuri tears out, please do not deep fry that because the full stuffing would come out in the hot oil and it would absorb more oil too. So it's better, shallow fry them like parathas. This time I am sharing two recipes together. Coming to Alur Dom, I'm very much thankful to my sweetest didi Simkie for this lovely yet simple recipe. I tried several types of Alur Dom earlier but this one is the yummiest one and very much hassle free. 1. Make the dough: Take all the dry ingredients in a big bowl and mix them together. 2. Add the 2 tbsp oil in the center. Again mix the oil with flour mix nicely with your fingertips and then add water a little bit at a time to make a dough. 3. Knead them for at least 7 to 8 minutes. It should be soft enough but still firm. 4. Once It is done, cover with any moist cloths and keep it aside. 5. Make the Bhala Masla (dry roasted spices) : Take one or two dry whole red chilies depending upon your taste buds. One is sufficient for me. 6. Add 2 tsp cumin seeds in a small pan, dry roast them till aroma comes up. 7. Turn off the gas. Let it cool down and then dry grind to a fine powder. 8. Make the stuffing: Take the peas, ginger, green chili (optional), 1-2 tbsp water in a blender and make a paste. 9. Heat one tbsp oil, add cumin powder, stir till oil separates. Then add the ground peas and salt. 10. Keep stirring to prevent it from getting burnt at the bottom. Once it becomes dry, add the bhaja masala and mix it nicely. Turn off the gas. 11. Make some small (coin sized) balls from the dough. Dig the center of the ball with your finger. 12. Stuff with the cooked peas and make it sealed nicely. Then give a round shape by rolling between your palms. 13. Slowly press down with a rolling pin to roll out the balls and get a small circle like puris. Repeat the process for the other balls. 14. Heat oil in a heavy bottomed pan. Once it's ready for frying, put the kochuri in the oil one by one. 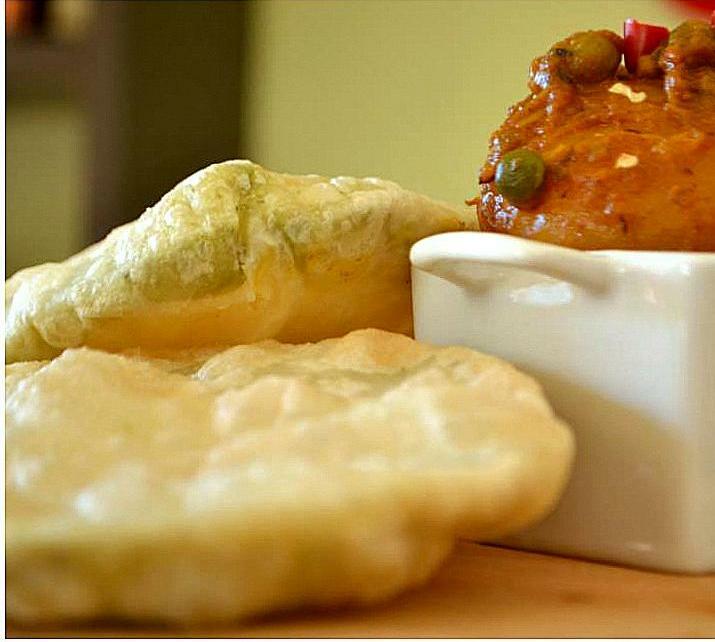 Toss it carefully and fry it with the spatula, till it becomes golden on both sides. 15. 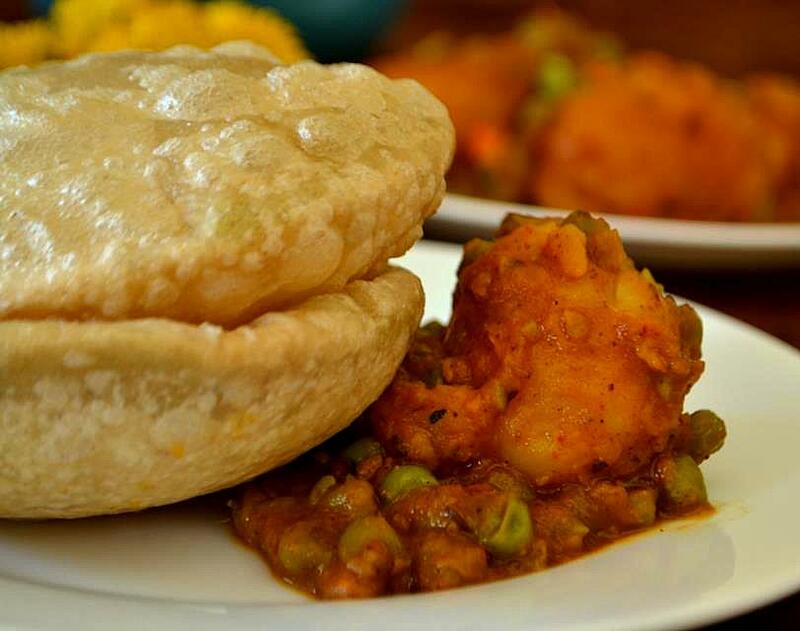 To puff it up, you should lightly press down the middle of the kachuri with the spatula and always control the heat of the oil by increasing or decreasing the flame. 16. Once it's done, transfer them on paper towel to absorb the excess oil. Serve hot with alur dom!! 7. Turn off the gas. Yeah it's ready!! Garnish with some chopped cilantro and serve hot with Kochuri / Puris / Paratha. Note : If you like the snow-white colored Kochuris, use only all purpose flour, skip the whole wheat flour.